How do I get to Zipolite and to the Lo Cósmico? No matter where you come from, first you'll have to get to the town of Pochutla. There are direct busses to Pochutla from Mexiko City, Puebla, Oaxaca but also along the coast from Acapulco in the north or Chiapas (San Cristóbal de Las Casas) in the south. Coming from Oaxaca, there are two roads that the busses take. The faster second class busses take the very curvy but beautiful direct road. The longer but less curvy road through Salina Cruz is usally taken by the first class night busses. Depending on the type of bus you take, the Oaxaca-Pochutla trip will take 6 to 8 h and cost 70 to 100 pesos. Once in Pochutla, you can either take a camionetta for less than 10 pesos or choose a taxi, which should not cover you more than 60 pesos for the half hour trip to Zipolite. 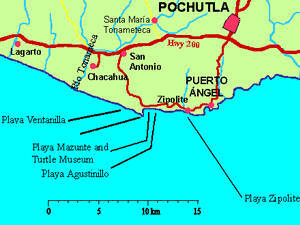 About one hour south of Pochutla is the international airport of Huatulco. You can book a flight from your home country or a national flight from any mexican city to Huatulco. From there, take a bus (10 pesos) or collectivo (20 pesos) or a taxi (around 50 pesos) to Pochutla. From there, go to Zipolite as described above. The paved road from Pochutla to Puerto Angel and Zipolite goes on to Mazunte and reaches the main coast road no. 200 some kilometers north of Pochutla. So coming from the north along the coast you may choose this entrance towards Zipolite, coming from the south or from Oaxaca (road no. 175) take the road at the junction of coast highway 200 and no. 175. See the map for more information. From both junctions its a less than 30 minutes drive to Zipolite. The Lo Cósmico is at the very end of Zipolite (coming from Puerto Angel). Take the dirt road on your left, just after the Piña Palmera. There is a bigger and more detailed region map under this link. If you want to download and print it, press your left mouse button on the link and choose "Download Link to Disk". Then you can open the GIF-File in any imaging software to cut and arrange it before you print it.